The old Brown county Jail, with its historical marker, is still around; but it no longer houses prisoners. Instead, it is the home of the Brown County Museum of History. Even today, although it is no longer a jail, its walls are full of memories of prisoners and those sheriff deputies who worked at the jail building, At times, the Brown County Sheriff lived in the jail. It was constructed between 1902 and 1903, exemplifying the principles which governed jail design in the late 19th and early 20th centuries. Actually, the first Brown County Jail was built in 1876 at the corner of North Fisk and Water Streets. The buildings and nearby courthouse burned in March 1880, and all of the county records were destroyed. Another jail and courthouse were built in 1881, and by 1901, the jail was labeled insufficient for the county's needs. It was in December 1901 that voters elected to issue $30,000 in bonds for a new jail. County commissioners accepted a low bid of $24,925.60 from the firm of Martin, Moodie, and Company in partnership with Youngblood Brothers. Work began soon after the contract was signed, and on June 20, 1903, the commissioners' court accepted the new jail building. William Hood was appointed local architect and contractor. In 1963, while still serving as the county jail, the building received a Texas historical marker. Today, the building is one of the most impressive structures in West Central Texas, conveying fortress-like strength and romantic medieval military tradition. 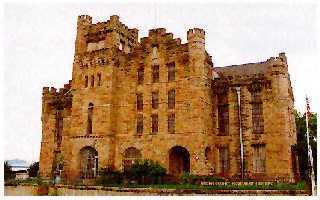 The Brown County Jail building is important for its outstanding architecture and for the local history it embodies. When the new county jail was built in 1981, the Brown County Historical Commission began to take steps to preserve the building as a site for a museum of local history. Money was raised from both private citizens and form local groups. In addition, a grant from the Texas Historical Commission was used for renovation and repair. The old jail has been listed on the National Registry of Historic Places. Located at 212 N. Broadway, the museum is open for tours on Wednesdays from 1 PM to 4 PM and on Saturdays from 11 AM to 4 PM. Phone 915-646-1580. For more information contact the Brown County Historical Commission, PO Box 1621, Brownwood, Texas 76804.